The Royal Enfield Bullet series is the world’s oldest continuous production motorcycle. Days after captivating Royal Enfield enthusiasts with the custom Royal Enfield Bullet Carbon Shot, DC Design has released two new colour options for the kit - Admiral Blue and Cardinal Red. 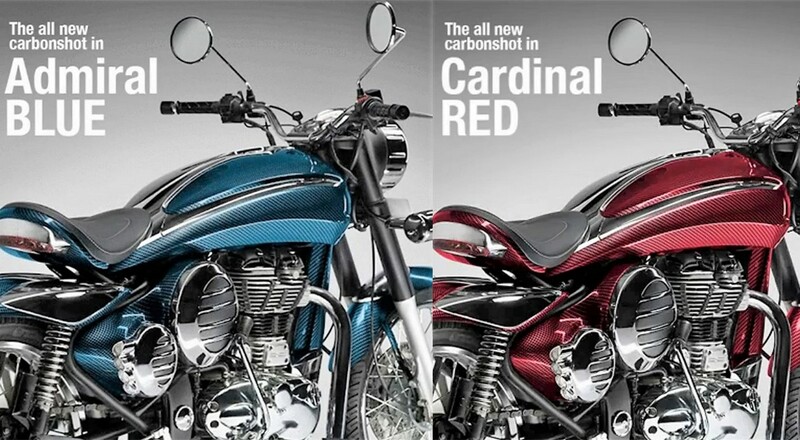 The Royal Enfield DC2 Carbon Shot kit will now be available in Admiral Blue and Cardinal Red as well. Being one of the most customised motorcycle brands in the country, Royal Enfield has a long-standing relationship with custom builders that shows no sign of weakening. That’s not all; DC Design tells us that the custom parts are made up of carbon fibre reinforced plastic to keep the bike lightweight without compromising entirely on strength. The Royal Enfield DC2 Carbon Shot gets body parts made of carbon fibre which will make the bike lightweight. The reduced weight will also help the bike feel faster than the standard motorcycle. DC Design has priced the custom kit at INR 76,000.